By special request: we finally posted a few new photos in the photo section. Check out Charlotte working so hard in therapy! We're off to see Dr. Khan this afternoon and will hopefully have more news about chemo timeline later today. We said goodbye to Grandpa and Grandma Bonita this morning. They're headed to Florida (so jealous...even with the slightly warmer weather, I'm sick of winter). So, anybody else see LOST last night? Dude! What an awesome show! It is definitely the only show I keep up with anymore on a regular basis and they only one that I HAVE to see "live" each week. I'm totally amazed by the acting and the amazing storytelling. True genius. Gotta go love my daughter. First of all, the parking gods were with us today because finding a spot in the garage was totally hassle free. I think Roger is my good luck parking guru. He has the best karma for stuff like that. Of course, getting in to see the doctor was not nearly as lucky. It wasn't horrible, but we were definitely on "hospital time". Charlotte was sufficiently entertained by volunteers and the wonderful music therapist at MCV (who could that be? Thanks, Melissa!). The Hem/Onc clinic is like a super-charged doctor's office. We loved the animal-themed rooms (especially for a kid like Charlotte who loves wildlife) and the in-room entertainment is super deluxe (DVD players and VCRs in every room). So even though we had to wait, we had a lot to entertain us. Dr. Khan took some history and got an update. Our current plan is to begin chemotherapy a week from today (why does everything seem to happen on Thursdays for us?). Some not so good news is that because she's not back to being "potty trained", they will need to put in a catheter on Wednesday to collect an accurate urine sample for about 24 hours. She will also get a hearing test to get a baseline as some of the chemo drugs can cause temporary and/or permanent hearing loss in kids. Thursday will start at about 9 AM in the clinic with IV fluids and getting everything "ready". Then we will be admitted into the hospital until probably Monday. She will have a course of 4 different chemotherapy drugs as well as other medications that combat some of the effects of the chemo. everything will be administered via IV. We will be back on the 7th floor of the main hospital but do not need to be in the PICU or the Intermediate Unit. Roger and I are currently figuring out our schedule for the weekend and we will let you know if we need any assistance. The good news is that Aunt B will arrive on Friday so that will help a lot! She will have PT/OT at Children's until this starts and may even be able to continue therapy at the hospital as long as her energy level stays up. For those wondering, visitors will be welcome as long as the "normal" precautions are observed. Please don't visit if you are fighting a cold or recently got over being sick. We don't know at first how she will react to all of the medications so don't be surprised if you do choose to visit and she is not up for "social" time. I guess that's all for now. I'm sure Roger will add his two-cents this evening. We had an early morning, as Roger mentioned, but she didn't fight getting up too badly. Her therapy session went well and she worked HARD. They are having trouble scheduling our PT and OT together since they are trying to get us in as much as possible on very short notice, but her PT had a last minute cancellation at 8 AM this morning so the OT and PT co-treated! Gotta love the interdisciplinary model! They had her working on her hands and knees on a puzzle (requires extra balance and strength), working over a bolster, standing and sitting on a platform swing, walking, and (of course..her favorite) riding that trike. She also worked on using that left hand. We had to seriously hold down the right but she did it with only a few tears and whines. She had a somewhat relaxing morning after that with some movies but we got up and walked before and after lunch. When Roger got home, we changed her dressing on her central line. She didn't like that much but a necessary evil, I guess. After that, I left them to their devices and scuttled off to work. (Shhh...don't tell my boss I'm writing this while on the clock!). She has a speech eval this afternoon and then we go see Dr. Tye at MCV tomorrow for a follow up. I love the "Easter Egg" idea someone proposed about shaving heads and losing hair. I'm still not sure if I'm up for that but I know we've already had a few people volunteer their scalps! I guess my child who never really liked having her hair combed let alone having it "styled" with barettes or bows will somehow get a reprieve from the hair routine...gonna miss those curly curls, though! They are now participating in a Hanover County Schools program in which students with special needs come in with an assistant and are given "jobs" like bussing tables, greeting customers, etc... This gives them confidence, social interaction, and real job skills they can use in the future. Kudos to everyone involved with that. 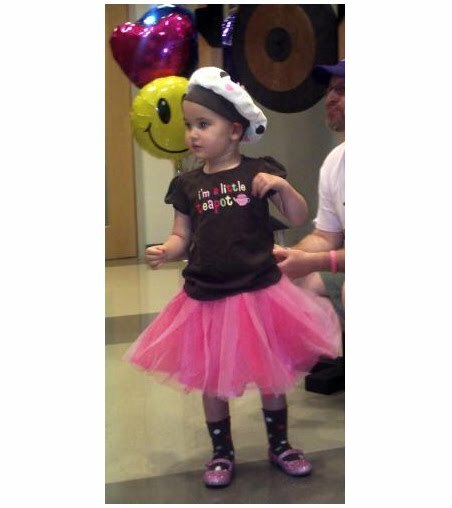 Paired with our partnership with them at Romp n' Roll and the generosity they have shown to us during Charlotte's "tumor adventure," I'm convinced they need to have a lifetime membership of some kind cause I'd sign up in a heartbeat! I need help (insert joke here). I was told by an RNR customer of a Caringbridge site for a guy named Jacob but I have since lost the paper I used to jot it down. The dad is now staying at home full time to take care of him. Anyone reading this have the slightest idea what I'm talking about? Please let me know if you do. Gotta go work on Rompy's Band! Charlotte is sleeping after a very productive morning. We went for PT and OT at the Children's Hosptial West End location. She did well working with Ms. Lauren and Ms. Aileen with very little whines or fussing. She is doing SO much better walking on her own. We are practicing standing on one foot, standing up and sitting down, and walking (including walking up and down stairs). Her shining star moment today was when Ms. Aileen brought out the pink princess tricycle for Charlotte to ride. Without ANY prompting, Charlotte stood up from her chair and walked about 3-5 feet just to get to that trike! Then she worked on riding the tricycle up and down the hall. Superstar! Grandpa and I were most impressed. We capped off the morning with a visit to Costco for our famous traditional lunch of pizza and ice cream (frozen yogurt). She fell asleep on the way home. Our therapy schedule is (mostly) set for the next two weeks. We are aiming for Monday and Thursday mornings which works very well with our RnR schedule. This should take us up till the time that chemo will start. "Mommy, when I grow up I want to be a mommy just like you." Sniff sniff! She's a doll. I know you're all just dying to know...The date was a very nice night out. Of course, mostly all we did was talk about Charlotte!We were going to get dinner and then a movie but then the evening got a little later than we expected so we decided against the movie and went to find somewhere without an hour wait on Valentines (Don't try that at Texas Roadhouse! )We finally settled in at Ruby Tuesday's in VCC which is one of our preferred places. Can't beat the turkey bella burger.Charlotte was cared for (and I do mean cared for) by Auntie 'Retta who, as usual, showered her with love and positive energy all night.CJ was uncomfortable a good part of the evening and was still awake when got back after 11:00pm. Both Rachel and I sat with her and the 3-hour nap she got yesterday, coupled with the pain kept us up until about 1:10am. We were up watching Diego, we read books, we ate, toast and butter (real butter! Mmmm...). Finally I just said, "Charlotte, as soon as you eat this last piece of toast, you HAVE to go to sleep." She said, "OK." and was out in about a minute.Busy day for me today. I'm starting off a 10am Birthday Bash, heading up to Ladysmith for a special Pirate Party for Ladysmith Village at 1:00, and then continuing northward to Woodbridge for an Uptown rehearsal. This week is huge so Dad and Juanita are coming back up to lend extra hands. I believe there's a new case for the foam rubber hockey sticks in RNR's future. Thanks Dad.Well,Here's to Charlotte and Rachel sleeping in. Both very good things.By the way, CJ ended up having four small walks yesterday. Good work, girl! Another long post lost to the etherworld...Not sure what happened. Let's try it again. The most important event of the day: It's Peter Gabriel's birthday! "All the monkeys in the zoo wish you Happy Birthday too. Happy Birthday to you!" Kind of a dicey night for both of us. For CJ because of head pain and rough diaper changes and for Daddy because a customer delivered a package of chocolate macadamia nut cookies to Romp n' Roll and he just HAD to eat almost half the package and now his tummy is rebelling. My own damn fault. Cj and I are viewing what promises to be the first of many viewings of Dora's Christmas. I reiterate what Rachel said: The things we do for our kids! As for the ramp...Barclay, if someone could see if the ramp is available, we could keep that on standby until we have a better idea of the demads of our situation. Then we could use it temporarily until the permanent ramp could be built. Here's the broken record again...The support we've received from all over, but especially from the Randolph-Macon College community has mind blowing. It will take us a lifetime to pay it back/forward but I guess that's how it ought to be, eh? She has had a very good night with only minimal "wakefulness". Mommy was definitely sick of watching Diego last night but it made her happy...the things we tolerate as parents! At the moment (8:15 AM) she is still snoozing away peacefully. We are waiting for the doctors to call her for another head CT. Assuming everything goes well, we will begin the discussion about removal of the ventric line. This is just part of the seemingly endless process that counts us down to home (we hope). We will also be able to give her hair a REAL washing when the ventric comes out. Oh joy! I want to give a small shout-out to the Shultz family. As part of the wonderful care package they brought for us, there was a book of "grown up" puzzles (crosswords, etc.). This has been a great source of amusement for Roger and myself. A good way to pass the time. I personally slept through Roger's radio appearance so I hope it went well. On for another busy day. Another very busy day. Her head CT looked great so they came to remove her ventric line today. One less tube to conten with. She also got a bath and a great hair washing! She is resting peacefully now. Occupational Therapy came to work with her earlier today. That was a lot of hard work. I think I got a taste of how hard therapy is going to be for her. It was definitely tough for her to move that left side and coordinate bilateral movements with her hands. And of course, in stubborn Charlotte fashion, she fought finishing the task. She knows how hard it is and I am sure it is very frustrating for her. Lots of tears and a very patient OT. We also had a visit from Dr. Robinson, the rehab specialist. Based on the discussions he has had with the team, they continue to lean more towards outpatient therapy. This will, of course, mean a lot of work but we will be working with a great team. She will need a wheelchair and perhaps a ramp at home (a project for grandpa?). She might need a bed with rails at home but we don't know yet. There is a lot of question about how much mobility she will regain on her left side. She may always have some weakness but she should be able to regain some if not most of her mobility. Discharge is still looking much like Monday or Tuesday. It seems that on the food front, I think we have things well covered till then. There is plenty of food in the freezer at home and we have at least a couple meals left to eat from here at the hospital. I will be setting up a Care Calendar in a few days that will have information about specific needs we may have for child care, meals, errands, etc. I will let everyone know when that is ready and you can jump in to help. She had a very busy morning. She was awake from about 3 am-5 am, just fussy and "not sleepy". We drew some pictures and she finally went back to bed. After sleeping in until about 8:30/9, she fed herself a BIG breakfast (eggs, sausage, waffles). Dr. Tye clamped her ventric today so we will see how she proceeds with that. If all goes well, we could be released by Monday. PT came by and she worked on walking, standing, and sitting. Shaaron is recommending in patient rehab for now but if she continues to progress enough by our hospital release date, we could look at outpatient rehab. Inpatient would be at Kluge (Charlottesville). Outpatient could be in Richmond at Children's hospital. She also has a urinary tract infection (oh goodie) so she has started a round of antibiotics. Not so unusual given the fact that she had a catheter along with all the messy diapers. She has actually told us a few times that she needed to go potty and has been making trips to the toilet. What a trooper! She also had visits from her preschool teacher and Child Life today...all working to keep her engaged and energized. She ate lunch sitting in her wheelchair today ad has done a great job overall. Now she is "chillin'" with Dora and watching some episodes in bed while downing more chocolate milk!!! PS: Much thanks to the Carpenter family for the yummy meal last night. The pork loin and vegetables were fabulous! Before I proceed further with the Charlotte update, thanks again to the Plank family for a yummy home cooked (and healthy!) meal. Such a blessing. Charlotte ate a great dinner as well of spaghetti, meatballs, broccoli, and peaches, and (of course) more chocolate milk. She also pooped on her own again. Yay, Miralax! She has been "vegging" on the tv this evening but that's just fine as mommy needs some time to veg too. We heard from the neurologist that she will have a CT scan tomorrow morning. Her ventric clamp went well today and they will be checking tomorrow to be sure her ventricles are flowing properly with no blockages or mis-flow. While she occasionally complains of pain, it is not so extreme that it incapacitates her. I managed to give her a sponge bath and comb most of her hair. She's looking better all the time! Now I'm off to read my Entertainment Weekly while Strawberry Shortcake blares on the TV for Charlotte. Rachel is pulling a three nighter because I need to be places in the mornings which is good and bad. Good because we're getting more and more back into the swing of things but bad because I only got to see Charlotte for about an hour and a half today. What was very nice was that she is looking and acting more and more like Charlotte everyday. I even got invited into the bed to snuggle a little (collective, "Awww!") Of course I was nearly falling off the bed and dosing here and there on top of that so I was in serious danger of rolling off and into the jail-cell style toilet next to the crib. Tomorrow morning I resume my duties for Romp n' Roll To Go at Primrose School (thanks so much to Babz for covering for me the last two weeks). I get addicted to my kiddies and it will be very nice to see them all again. We'll be starting our RNR2Go up in Ladysmith next Tuesday which is very exciting. If you're up in that area, stop by Miss Alyson's Countryside Daycare and say hi. Sounds like a Romp n' Roll commercial, eh? Now here comes the next fun part...To all of those people who were willing to sit with/watch CJ once in a while, there's a good chance we'll be needing that soon. She might (emphasis on "might") be released from the hospital Monday or Tuesday. With Rachel and I both trying to keep RNR moving forward, and other events coming up, we could use a few good volunteers. I'd like to ask folks to please reiterate their willingness to participate and what times they may be available including possible (but not probable) overnights. I'll pull out the calendar and start signing people up as I can. Thanks in advance. Classes at RNR were great tonight and I even got to see a mischievous side to Miss Audrey that I hadn't seen before. Love to see dem kiddies growin'! Also love having a functional water fountain in the back. Thanks Daddyo!